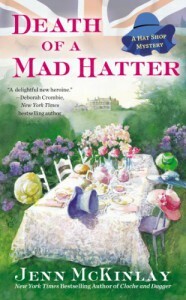 Death of a Mad Hatter - What is Kimberly reading now? Either I want to go to London, or I want to buy a fancy hat. Since I have nowhere to wear said hat and my friends would look at me like I’m crazy, I’m opting for London. I always enjoy McKinlay’s books. They either make me hungry or just very happy. As usual with McKinlay’s books, I can never figure out who did what until it’s revealed to me at the end. I think it has to do with the fun characters and fun setting.